Cold hands when cycling in winter has always been a problem for me. Wilst researching my trip to Lapland I stumbled upon a word I’d never heard before “Pogies”. As far as I could tell there are two brands on the market that look like good quality. Hotpog.co.uk in Europe and Dogwood Design on the other side of the pond. Hotpog were kind enough to let me test the newest Pogies in their line, the Arctic Hotpog mountain bike Pogies. My travel companion Helen used the Dogwood Pogies so we had a good chance for a comparison. 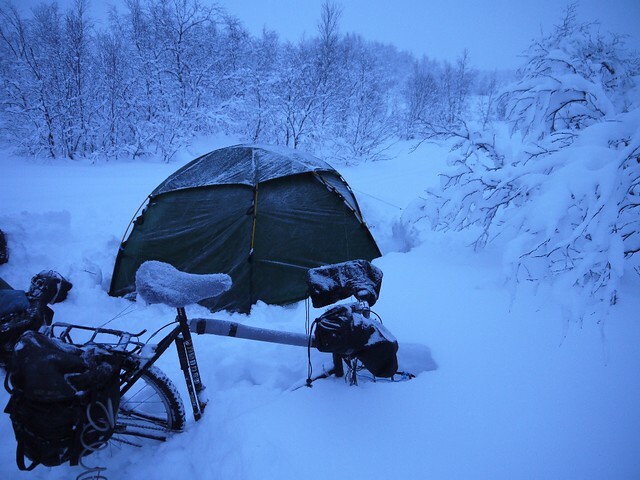 Temp range : cycled -5 to -28 degrees C in Sweden, Norway and Finland mid Jan to early Feb. 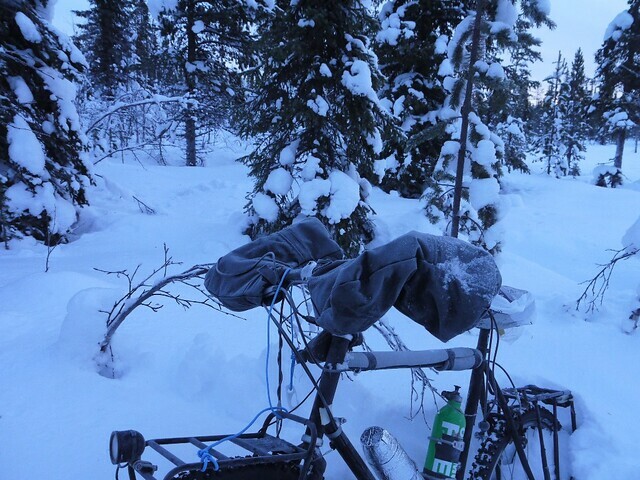 I left them on the bike at night so they were cold soaked down to -30 some mornings. Overall impression : Very impressed, it would of been a miserable 3 weeks without them. Warmth : Ignoring the first couple of days were I was blundering with my gloves and using them wet/frozen alot, my hands were never cold in the Pogies once they got warmed up in the morning (20 mins or so cycling). Down to about -10/-15 I didn’t wear gloves inside them unless I was trying to defrost my gloves. 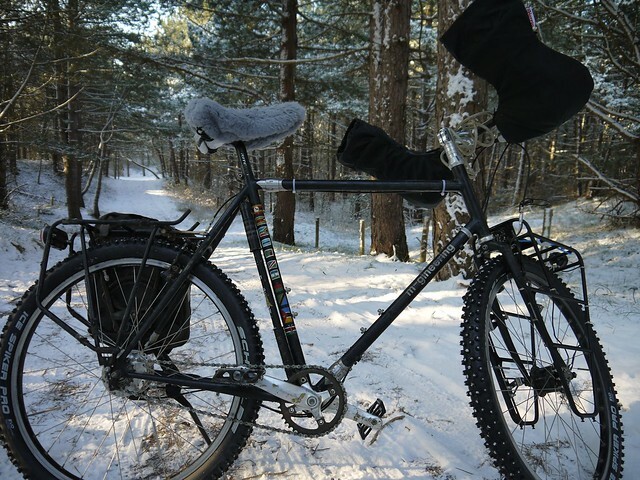 Rather ironically even at -10 sweaty hands was an issue and I often had difficulty changing gear (I have a Rohloff twist grip). Under -15 and especially under -20 cold coming through the handlebars was as much of an issue as outside air. 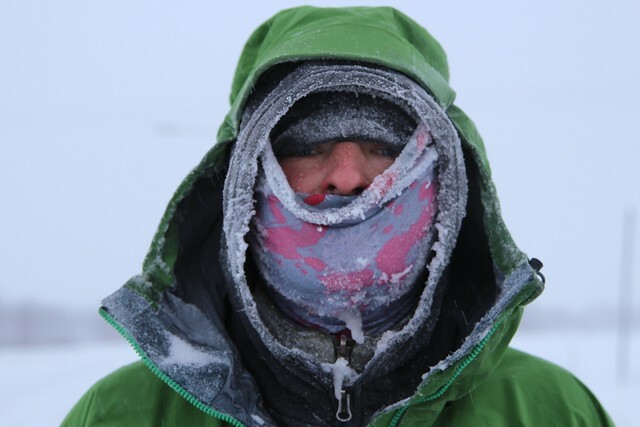 Even at -28 +windchill my hands were fine if my gloves were dry. Next time I do a trip like this I’ll take thin silk liners for inside the Pogies for more grip. Underpog Pockets : The Arctic Pogies are fitted with pockets underneath. These proved very handy as I don’t use a handlebar bag. I kept my phone in there while charging it with my hub dynamo, would be even handier for commuting for my keys/ work pas so I don’t have to fiddle in my pockets for them :). Installation : The Pogies have a waterproof zip, elastic + draught stopping velcro system which makes installation easy. They were much easier to install than Helen’s Dogwood design Pogies. Sometimes I even opened up the velcro to let some air in :). The right one was quite a snug fit though due to the my combination of bar ends, Ergon grips and the Rohloff twist grip. (For people with this combination it might be worth asking if they’ll make a slightly wider version if you still want to use your bar ends). Gaitors : The gaitors are fitted with an elastic drawcord. They work as well as anything is going to during riding. When stopped they proved essential in keep the snow out (when dumb arse here remembered to close them anyway….). One day Helen and I swapped one Pogie for a comparison (not sure if she had the standard or plus). It was about -10 that day and we felt no difference in temperature between the Pogies. The Dogwood design ones were more spacious, slightly lighter, though more difficult to install around bar ends, apart from that there was no serious difference. Bearing in mind my hands were pretty much always warm down to -15 and looking at the range of Pogies by Hotpog. 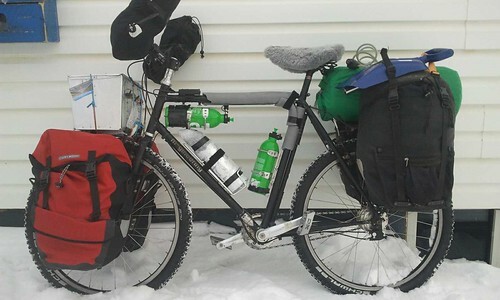 I suspect that for most people the cheaper Explorer or Adventurer versions would be good enough for commuting or not too extreme winter trips. You then have more flexibility with gloves without hands getting too sweaty. 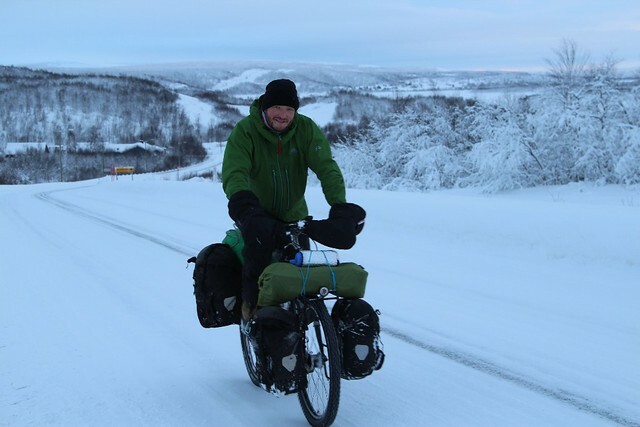 I for one have discovered a solution to the problem of cold hands while cycling in winter :). Hey! Thanks for the review. I’m looking into getting a pair of the Artic HotPogs for myself. 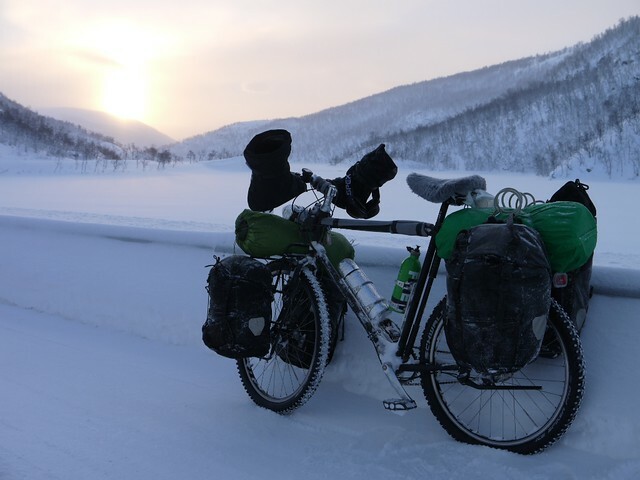 I live in the alps, and it can get pretty cold here in the winter (-38c last year) but is usually around the -15c mark for bike rides to work. Do you think the Artic hotpogs would be best, or should I go for the “basics”?